The head of the Donetsk exarchate of the Ukrainian Greek Catholic Church was not allowed to enter the occupied area. Militants of the self-proclaimed Donetsk People's Republic threaten believers and priests of the Ukrainian Orthodox Church of the Kyiv Patriarchate with seizing their churches in the areas under their control, the bishop of Donetsk and Mariupol, Serhiy, has said at a prayer breakfast with the head of the Donetsk regional military-civil administration, Pavlo Zhebrivskyy. "According to Serhiy, there are 36 parishes of the Ukrainian Orthodox Church of the Kyiv Patriarchate in the temporarily occupied territory. The occupiers demand that they be re-registered under the so-called republic's laws. Otherwise, they threaten to seize the churches and expel priests," Zhebrivskyy's office said. Believers and priests of the Ukrainian Greek Catholic Church are also facing repression in the occupied territory. 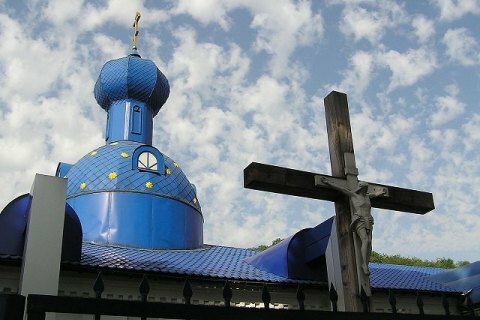 According to the head of the Donetsk exarchate of the Ukrainian Greek Catholic Church, Stepan, he was not even allowed to enter the occupied area to hold a prayer. As reported earlier, on 31 August 2017, Russian law enforcers stormed into the Simferopol church of the Ukrainian Orthodox Church of the Kyiv Patriarchate and used force against Simferopol and Crimea Archbishop Klyment, having injured his arm. They confiscated icons and property of the church. Crimean Tatar leader Refat Chubarov said that the blockade of the cathedral is yet another evidence of mounting pressure on anything Ukrainian in Crimea. The Ukrainian Orthodox Church of the Kyiv Patriarchate filed a complaint with a European court against the attack on the Simferopol cathedral.